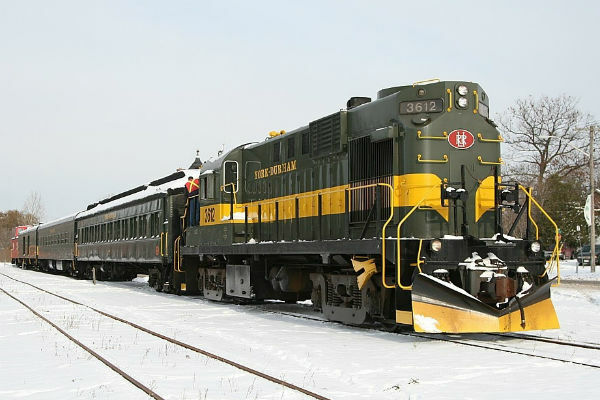 One of the most special family holiday experiences in the GTA each year is, without a doubt, the Santa Train at York Durham Heritage Railway. Climb aboard the decorated (and heated) heritage train for live entertainment and a visit from Santa. Santa visits each child at their seat during the one-hour round-trip train ride, and kids also receive a gift bag at the end of their ride. In addition to one-on-one time with Jolly Old Saint Nick, you can expect musicians singing carols, a magician, clowns creating balloon animals. It’s an amazing holiday photo op! The train ride itself is an adventure, too, as you pass through the scenic Oak Ridges Moraine. It’s the perfect backdrop for all the holiday happenings onboard and is especially pretty when it snows. The Santa Train departs three times daily each weekend November 24–December 16 from (and back to) Uxbridge Station. There are three departure times per day, at 10 am, noon, and 3 pm. Tickets are on sale now. York-Durham Heritage Railway is a non-profit association run by volunteers. The railway is the only one of its kind in the GTA, offering trips on Sundays during the regular operating season (June–October). In addition to the regular Sunday runs, York-Durham Heritage Railway offers a number of themed train trips including our popular Teddy Bear Day, Fall Colours, Halloween and Santa trains! Learn more about York-Durham Heritage Railway train rides.